Update: Just two short months after Nintendo confirmed to us that production of the NES Mini would continue (below) it looks like the plug has been pulled on the mini retro console after all. Why Nintendo would choose to discontinue such a popular product is anyone's guess, but you'll be lucky if you're able to find the console going forward. Cancel that eBay bid - production of Nintendo's NES Classic Mini is set to continue, despite reports to the contrary. 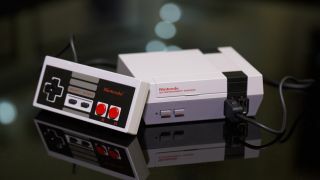 Some online outlets have this week claimed that the Nintendo NES Mini's production lines were set to grind to a halt, making the hard to come by console even more difficult to get hold of. The reports arose from a Neo-Gaf post, citing Nordic distributor Bergsala, claiming that Nintendo had ended production and would send out final shipments of the console in the spring. This would result in some outstanding orders being unfulfilled. According to Nintendo, this is not true. TechRadar has received a statement from Nintendo, refuting the claims. "Production for the Nintendo Classic Mini: NES continues, and NOE [Nintendo of Europe] will continue to ship units to retail on a regular basis," said a Nintendo UK representative. So you might want to hold fire on selling off that kidney before splashing out on a second hand console with an inflated price tag. The interest in the inaccurate report does however highlight the fact that, even months after launch, some fans have been unable to get hold of the console. Production may be continuing, but Nintendo still needs to ramp up production if it wants to avoid resellers taking advantage of the vacuum.